Alex Morgan and Marta each scored twice as the Orlando Pride beat Sky Blue FC 5-0 at Orlando City Stadium in front of a crowd of 5,243 fans on a rainy night in Orlando. The kickoff was delayed for one hour and 16 minutes because of weather in the area. The win moves the Pride into the fourth and final playoff spot with 26 points (7-6-5 record) pending the rest of the Week 16 results. The Reign are just two points behind and play Sunday night at home vs. the Courage. Sky Blue FC drop down to sixth place with 23 points. Morgan and Marta needed just four minutes to get on the scoresheet. 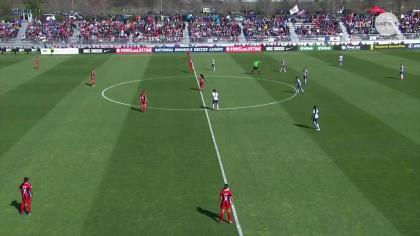 From midfield, Marta launched long ball right to the feet of Morgan, in between Morgan and Sky Blue FC defender Christie Pearce. Morgan collected the ball, cut back around Pearce, and hammered a left-footed shot past Sky Blue FC goalkeeper Kailen Sheridan to make it 1-0. The Pride got their second goal of the game in the 43rd minute when Camila nutmegged Sarah Killion at the end line and made a run into the box. 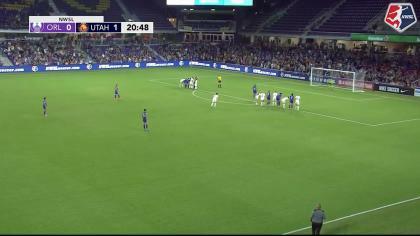 Camila then passed into the center of the area and midfielder Dani Weatherholt finished it for her first NWSL goal. In the 45th minute, Sky Blue FC midfielder Madison Tiernan found some space and nearly cut the lead in half but her left-footed shot went just wide. In the 47th minute, Morgan scored her second goal of the game and fifth of the season. The play started when Marta beat a double team on the left side and picked out Jasmyne Spencer in the center of the field about 25 yards from goal. Spencer took two touches and sent a through ball to Morgan in the box. As Sheridan came off her line, Morgan cut the ball to the far post to make it 3-0. Five minutes later, Spencer was the playmaker again, sending a cross into the box. Sheridan tried to catch it, but the ball bounced out of her hands and right to the head of Marta, who was making a run to the goal line. Marta headed it into the back of the net from about two yards out for her tenth goal of the season. The Pride’s final goal came in the 58th minute with Morgan returning the favor and assisting on a Marta score. From midfield, Morgan sent a long low through ball between two Sky Blue defenders that Marta sprinted onto the end of and then dribbled into the area. As Sheridan came off her line, Marta sent a low shot to the left corner to make it 5-0. The score was Marta’s 11th of the season, pulling her into a tie with Sam Kerr for second-place in the league behind Megan Rapinoe’s 12 goals. Kerr was denied her 12th goal of the season in the 90th minute when her header went off the crossbar. She had scored in five straight appearances for Sky Blue, but could not extend her streak to six games as the Pride limited her to two shots on goal in the match. The game marked the final game of her NWSL career for Pride midfielder Maddy Evans after she announced her retirement earlier this week. She entered the game in the 62nd minute. When the Pride earned a penalty kick in the 65th minute, Marta — passing up a chance for a hat trick and a tie for the league lead in goals — gave the ball to Evans to take the kick. But the perfect ending wasn’t to be as Evans’ attempt was stopped by Sheridan, who made seven saves in the match. Sheridan has made 69 saves so far this season, second-best in the league. Pride goalkeeper Ashlyn Harris played her first game since being injured on May 21 and made three saves to earn the shutout. She made two strong stops in the second half to keep Sky Blue FC off the scoresheet. 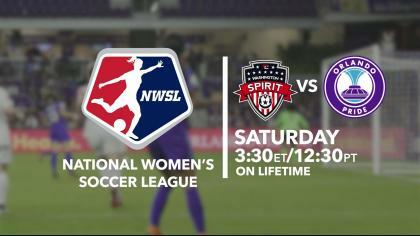 Both teams will next be in action on Saturday as Sky Blue hosts Seattle Reign FC and the Pride visit the Boston Breakers. Match ends, Orlando Pride 5, Sky Blue 0. Second Half ends, Orlando Pride 5, Sky Blue 0. Corner, Sky Blue. Conceded by Kristen Edmonds. Samantha Kerr (Sky Blue) hits the bar with a header from the centre of the box. Assisted by Taylor Lytle with a cross following a corner. Delay in match Mônica (Orlando Pride) because of an injury. Attempt saved. Samantha Kerr (Sky Blue) right footed shot from outside the box is saved in the centre of the goal. Attempt missed. Marta (Orlando Pride) left footed shot from outside the box is high and wide to the left. Assisted by Maddy Evans. Nickolette Driesse (Orlando Pride) wins a free kick in the defensive half. Substitution, Orlando Pride. Danica Evans replaces Camila. Attempt missed. Alex Morgan (Orlando Pride) left footed shot from the left side of the box is too high. Assisted by Nickolette Driesse. Offside, Sky Blue. McKenzie Meehan tries a through ball, but Samantha Kerr is caught offside. Attempt saved. McKenzie Meehan (Sky Blue) right footed shot from outside the box is saved in the bottom left corner. Assisted by Daphne Corboz. Substitution, Orlando Pride. Nickolette Driesse replaces Jasmyne Spencer. Attempt missed. Samantha Kerr (Sky Blue) header from the centre of the box is just a bit too high. Assisted by Taylor Lytle with a cross following a corner. Corner, Sky Blue. Conceded by Marta. Attempt blocked. Nikki Stanton (Sky Blue) left footed shot from outside the box is blocked. Corner, Sky Blue. Conceded by Mônica. Attempt blocked. Camila (Orlando Pride) right footed shot from the centre of the box is blocked. Assisted by Marta. Penalty saved! Maddy Evans (Orlando Pride) fails to capitalise on this great opportunity, right footed shot saved in the bottom right corner. Penalty Orlando Pride. Jasmyne Spencer draws a foul in the penalty area. Substitution, Sky Blue. Maya Hayes replaces Sarah Killion. Corner, Orlando Pride. Conceded by Nikki Stanton. Goal! Orlando Pride 5, Sky Blue 0. Marta (Orlando Pride) left footed shot from the centre of the box to the bottom left corner. Assisted by Alex Morgan with a through ball. Goal! Orlando Pride 4, Sky Blue 0. Marta (Orlando Pride) header from very close range to the centre of the goal. Goal! Orlando Pride 3, Sky Blue 0. Alex Morgan (Orlando Pride) left footed shot from the centre of the box to the bottom right corner. Assisted by Jasmyne Spencer with a through ball. Attempt saved. Alex Morgan (Orlando Pride) right footed shot from outside the box is saved in the centre of the goal. Assisted by Marta. Second Half begins Orlando Pride 2, Sky Blue 0. First Half ends, Orlando Pride 2, Sky Blue 0. Attempt missed. Madison Tiernan (Sky Blue) left footed shot from outside the box is close, but misses to the right. Assisted by Samantha Kerr. Goal! Orlando Pride 2, Sky Blue 0. Dani Weatherholt (Orlando Pride) right footed shot from the centre of the box to the centre of the goal. Assisted by Camila. Attempt saved. Alex Morgan (Orlando Pride) left footed shot from very close range is saved in the centre of the goal. Attempt saved. Alanna Kennedy (Orlando Pride) header from the centre of the box is saved in the centre of the goal. Attempt saved. Jasmyne Spencer (Orlando Pride) left footed shot from the centre of the box is saved in the centre of the goal. Assisted by Alex Morgan with a through ball. Attempt saved. Marta (Orlando Pride) left footed shot from the right side of the six yard box is saved in the bottom right corner. Assisted by Stephanie Catley with a cross. Attempt missed. Jasmyne Spencer (Orlando Pride) right footed shot from outside the box misses to the left. Attempt missed. Camila (Orlando Pride) right footed shot from the centre of the box is close, but misses to the right. Attempt saved. Samantha Kerr (Sky Blue) right footed shot from outside the box is saved in the centre of the goal. Assisted by Taylor Lytle. Attempt missed. Marta (Orlando Pride) left footed shot from the left side of the box is close, but misses to the left. Assisted by Alex Morgan. Attempt blocked. Samantha Kerr (Sky Blue) right footed shot from very close range is blocked. Attempt blocked. McKenzie Meehan (Sky Blue) header from the centre of the box is blocked. Assisted by Taylor Lytle with a cross. Attempt saved. Marta (Orlando Pride) left footed shot from outside the box is saved in the bottom left corner. Assisted by Dani Weatherholt. Attempt missed. Taylor Lytle (Sky Blue) left footed shot from the left side of the box is close, but misses to the left following a set piece situation. Goal! Orlando Pride 1, Sky Blue 0. Alex Morgan (Orlando Pride) left footed shot from the centre of the box to the bottom left corner. Assisted by Marta with a through ball.